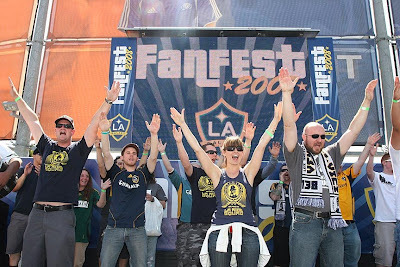 More than 4,000 fans were in attendance at The Home Depot Center on Saturday afternoon for the LA Galaxy’s Third Annual Fan Fest. The event, which was free and open to all fans, served as the official kick-off to the 2008 MLS season. Fan Fest 2008 gave fans the chance to see, meet and get autographs from their favorite Galaxy players while also experiencing some of the in-game entertainment options that will be available to them at Galaxy games this season. Even the LA Riot Squad got in on the action, giving the crowd a demonstration of a few classic Galaxy cheers. Season ticket holders also received an opportunity to participate in a question and answer session with Galaxy President and General Manager Alexi Lalas following his “State of the Galaxy” address to them. Lalas touched on a number of different topics including emphasizing the club’s commitment to turning around the on-field performance this season. He also touched on the signing of two-time FIFA World Player of the Year and Former Chelsea Manager Ruud Gullit, who will be tasked with returning the club to its winning ways. Look for a complete video of his speech in the next few days. The event began with a 60-minute scrimmage between the Galaxy and the San Fernando Valley Quakes (USL-Premier Development League), which the Galaxy won 3-1 behind first half goals from Carlos Ruiz, Michael Gavin and Landon Donovan. 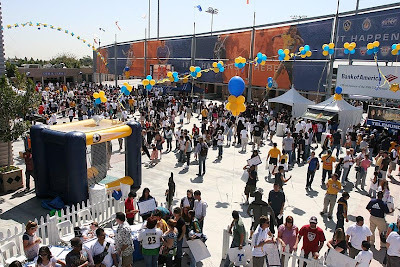 Fans were also treated to a series of interactive booths, games and contests before the day’s main event, the introduction of the 2008 Galaxy team. Following the match, Galaxy coaches and players went around the stands signing autographs for fans young and old. Landon Donovan stayed for the game and then signed autographs for fans before heading to LAX and a flight to join the U.S. National Team for the friendly against Poland on Wednesday. Meanwhile, David Beckham played most of the match and looked in good shape coming off the field including stopping to sign autographs for fans. He was present for the official team introduction and even addressed the crowd sharing his thoughts on the upcoming season, despite some audio trouble that made it difficult for fans to hear him. He then headed straight to the airport to join England prior to their match against France in Paris. There was an impressive array of Galaxy memorabilia current and some from years past. One fan even pulled out from the attic and moth balls, a giant 2002 Carlos Ruiz Galaxy jersey that received a smile and applause from the “Fish”. Following Becks’ lead, Josh Wicks brought his son Dominic, who was sporting his own, one of a kind, “Wicks #31” goalkeeper jersey, down onto the field to join him as he went around signing autographs for fans. Fan Fest 2008 also helped raise money for a pair of great causes. A silent auction of autographed memorabilia from the Galaxy and the rest of the sports world raised more than $7,000 for the Sward Accident Fund, which will aid a local Southern California family who are recovering from a recent tragic accident. An equipment sale raised more than $5,000 for the Los Angeles Galaxy Foundation. wow that's a big turn up. I'm thinking of coming over from Europe in 2009 just for that! When is the roster on the website going to be updated? Looking forward to the posting of the STH address video. Question: Eventhough David Beckham is in England waiting to play against France... and, Landon Donovan is in Poland for the USA vs. Poland friendly... The rest of the LA Galaxy team are still going to continue practicing and working on important drills at the HDC, right??? LA Galaxy's first 2008 MLS season game is this Saturday (ONLY six days away!)... I am hoping that Coach Ruud, Asst. Coach Cobi, Fitness Coach Chris,and Athletic Trainer Armando realizes how very important it is in getting our guys practiced, match-fit, and fully prepared for the start of the season! Our forwards and mid-forwards MUST practice SHOTS-ON-GOAL... they must improve and increase this number. Our LA Galaxy must get points "up-on-the-board". Please continue to keep us updated on practice sessions, plus updates on player injuries and recovery this week. Thanks! Love the Blog. Look forward to good stuff when the season starts. Is there an e-mail address where we can contact you and send fan pics? Or do you not want that?